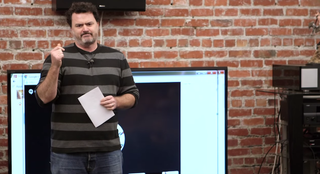 Three years ago, Tim Schafer raised over $3 million on Kickstarter, and today he’s finally here to deliver what he promised: a Q&A with Kotaku. Also he made some adventure game that came out in full this week. If you’re not familiar with Schafer, you’re probably familiar with the games he’s helped make, which include the first two Monkey Island games and Full Throttle, among many other LucasArts adventures including Day of the Tentacle and Grim Fandango. In 2000, Schafer left Lucas to found a new studio called Double Fine, where he’s led design on Psychonauts, Brutal Legend, and many other games both big and small. Today on Kotaku Asks, Schafer’s here to answer your questions. He’ll be here for an hour or so starting at 3pm ET. Ask whatever you’d like. UPDATE: And we’re done. Special thanks to Tim for coming and answering questions today.